It is tempting to begin a critique of the Brazilian economic model by lamenting an overreliance on exports to China and this would be true, but it tells only part of the story. To begin with, China has become the largest single importer of Brazilian goods, almost from a standing start at the turn of the 21st Century. During the first eleven months of 2012, its imports reached USD 42.7 billion, or 19.3% of the overall export pie, in line with exports to the European Union and well above the share of Argentina and the United States, at 8.2% and 10.2%, respectively. This represented an increase of 11.8% relative to the first eleven months of 2012, when the share of exports to China was 17.1%. Intriguingly, though, and perhaps worryingly, ten years ago the United States was the dominant trade partner, taking in roughly one-quarter of Brazil’s outside shipments. Whereas American appetite was for finished and semi-finished manufactured goods, China mostly cares about commodities and in the case of Brazil, especially soybeans and iron ore. Private investment has been sizable by some measures in recent years, but aside from well-publicized infrastructure modernization associated with hosting the World Cup and Olympics, this has focused on upgrading natural resource endowments such as mines, soybean fields and sugar cane plantations, along with some ill-fated capital spending by oil exploration and servicing companies, where any benefits would be narrowly dispersed with a lower multiplier effect. We should bear in mind it is not merely ‘direct’ extractors and refiners exporting coal, ores and steel whose orders fluctuate when Asian demand ebbs and flows, but also large-scale suppliers in the Engineering, Procurement and Construction (EPC) sector, along with providers of ancillary metals and materials such as the temperature resistant magnesite. As a result, it doesn’t take too much head scratching to conclude that the export engine has become less value added over time. Exports to China, about 60% of Brazil’s total exports to Asia, and indeed exports in general, punch below their weight in a nominal sense, given a ratio to GDP of around 10%. 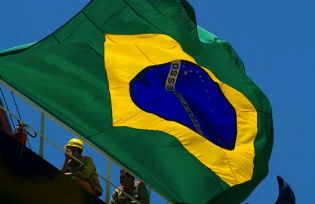 However, much faith was placed on the ability of Brazilian exporters to generate both price and volume gains on a year in and year out basis, as leading industrialists, trade groups and policymakers made the mistake of extrapolating from past trends and assuming that because this bilateral trade relationship survived the global crisis, it could survive anything. The relationship will not break, of course, but it will have to bend, and Chinese economic growth is undergoing an irreversible secular decline toward a 7.0%-7.5% pace from the prior 9%-10%, tendency, but this deceleration will be more impactful on the rest of the emerging world than might appear from the headline numbers, because domestic consumption is transitioning toward services and away from goods. With this in the background, the past ten years – or roughly the tenure of the PT, or Labor Party – have witnessed a standstill in structural reforms: momentum has been lost because cyclical and external factors had been sufficient to propel the economy forward. Despite complaints of Finance Minister Mantega that quantitative easing undertaken by developed economy central banks amounts to ‘currency warfare,’ it is a pull factor such as zero interest rates in the G7 that has enabled the country to import capital almost at will, serving as the swing factor in financing domestic activity in a broad sense, or commodity industry capacity expansion in a narrower sense. In addition, whereas financial regulators approached the topic of consumer credit with conservatism in the past, they have more recently been tolerant of an opening of the spigot. For example, the ratio of private sector credit to GDP reached 68.4% by the end of 2012, according to cross-country data published by the World Bank, which compares with a percentage of 48.9% as recently as 2008 and 29.0% in 2004. By contrast, the ratio of private credit to GDP was just 18.5% in neighboring Argentina. Brazil has easily enjoyed the largest credit explosion among the major Latin America economies over the past decade and only Chile and Panama have higher private propensities to borrow, although these have been relatively stable in the past several years. By most standards, the domestic financial system is sound. There have been some high profile calamities, of which more below, but at least for now, the systemically important institutions remain sound. Bank profitability is somewhat more than adequate, as measured by industry-wide average returns on assets and equity, and non-performing loans are moderate, with an aggregate ratio of around 3.5%, which are about one and a half times covered by precautionary provisions. In addition, Brazil boasts some of the largest banks in the world, including the state owned Banco do Brasil and private Banco Itau, with assets of US$441 billion and US$405 billion, respectively, according to central bank calculations as of end-September. Two additional state owned banks, Caixa Economica Federal and BNDES are close behind at US$350 billion and US$325 billion, while Banco Bradesco, with assets of US$294 billion, rounds up the top five. Given their size, scope and performance track record, these banks have been able to maintain stable investment grade credit ratings and therefore have been able to fund themselves at rates admirable in a global perspective. However, the table drops off fairly sharply thereafter, with the second tier dominated by Brazilian branches of foreign banks, leaving a large list of small and medium sized banks in the region of US$2-US$10 billion worth of assets. This is where problems have existed and are likely to be found in the future. The authorities have been forced to find buyers for or liquidate institutions such as Banco Panamericano and Banco Cruzeiro do Sul, which have suffered from fraud or mismanagement. Although relatively small, their activities have focused on areas such as small and medium enterprises or the Brazilian form of payday lending known as consigned credit. As a result, their customer base runs into the millions and for this reason, it is exceedingly difficult for the regulators to keep an eye on them. Meanwhile, these and other medium sized banks have often funded their activities internationally, and when they suffer from actual or perceived outsized credit risks of their own, the future funding cost rises not merely for them, but for the remainder of their peer group as well, because of difficulties in differentiating among similar banks. The risks of permitting these niche banks to continue to operate probably outweigh the benefits, but similarly, the costs of transition toward a wholly-different banking model and regulatory inertia prevent a thorough reform of the system. Moreover, we should recall that they provide a service perceived by policymakers to be socially desirable; that is, making credit more widely available to those on the lower end of the income scale. If the state owned banks are sounder, as measured by non-performing loan ratios, they have been growing much more rapidly than the privately owned banks, in part reflecting an indirect mandate to undertake ‘quasi-fiscal policy.’ That is, the federal treasury is constrained by rigid spending and deficit targets, and the central bank is operationally independent. As a result, if the government wishes to stimulate the domestic economy, it can do so quietly through the commercial banks it controls, although it must stand behind any eventual losses. On this point, we’d highlight the rapid rise in mortgage lending over the past five years, especially by Caixa Economica. In sum, the economy has been propelled in recent years by a combination of rising export demand and rapidly increased domestic credit, partly funded by borrowing from abroad. This combination enabled the economy to gradually recover from the currency crisis of 1999, and GDP growth eventually averaged 5.5% in the two years before the crisis. However, if we look ahead, it is difficult to find the momentum to predict a growth pace even half as high. To be fair, risk premiums will remain moderate by international standards and other constructive factors, such as a respectable population growth rate of 1% per annum and tight labor markets (with unemployment remaining in a range of 5.5%-6%), along with natural income convergence, will keep the country out of recession. The GDP speed limit would be much higher if the country could transition toward a model in which Brasilia spent less on pensions (7.2% of GDP, or more than its current employee payroll) and the government encouraged higher private investment and saving, rather than credit growth and consumption. In addition, the economy is too expansive and diverse for the government to meddle too much in manners that would be disruptive. However, this reflection does not apply across the board, as we know from interventions in the electricity, telecoms and beef sector. Moreover, the national development bank BNDES often ‘picks winners,’ through its equity investments in various large corporations, and has a tendency to restructure debt on favourable terms. The performance of its credit portfolio is admirable, mostly though, because it is treated as a preferred creditor, and because of its flexible accounting. Regulators allowed the electricity generation holding company known as Rede Energia to fail, at significant cost to foreign investors, but both performed poorly in overseeing and studying its constituent units, which suffered from some of the weakest operating indicators of any broadly defined peer group. The telecoms regulator Anatel during 2012 temporarily prohibited major cellular providers from selling new packages to households in response to customer service complaints and this decision was protested all the way to the federal courts. In addition, the government has embarked on a series of power rate reductions, which would be to the benefit of major industrial users of electricity, but which were announced suddenly and in a fashion that disrupted the investment climate. It is true that electricity tariff structures had unfairly favoured producers over consumers of electricity, and were internationally inconsistent, but it is another sign of failure of the regulatory apparatus that conditions were allowed to reach that stage. Finally, Petrobras was not too long ago one of the most widely respected major oil companies and this was indeed something to boast about, because state owned energy giants are famously inefficient. From a moderate base in 1995, Brazilian output (and mostly Petrobras) tripled to an average of 2.14 million barrels per day by 2010, according to data from the BP Statistical Review. However, production stagnated thereafter and despite announcing major exploration and investment programs, there is little possibility of restoring the healthy growth rates of the prior decade. Newcomers to the Brazil story should not be misled by survivorship bias, reflecting the dissolution or near-dissolution of many once high-cap stocks, including notably the flagship airline Varig and the oil services manufacturer Lupatech. Moreover, it is the oil industry that is responsible for one of the largest post-global crisis busts of a non-financial corporate debtor, the petroleum exploration company OGX. However, as its lending and commercial contracts were primarily between private creditors, the borrower and other entities, the government should largely be resolved of responsibility of any losses, whether financial or in terms of reputation. Richard Segal joined Jefferies International in April 2011 and is responsible for fixed income strategy across the emerging markets. During the previous four years, he worked in a similar capacity for Knight Libertas and Renaissance Capital. Immediately prior, he was Chief Strategist at Argo Capital, a global credit fund. He has been a consultant to major commercial banks, institutional investors and corporates, where he focused on Eastern Europe and Central Asia. During his career, he has developed a variety of economic and financial models concerning sovereign risk, term structure of bonds, and relative value of currencies and commodities. Mr. Segal is the editor and co-author of a guide on the sub-Saharan capital markets, the author of The Russian Economy and was a contributing author to The Handbook of International Investing. He has also written and published nine works of fiction. He is a graduate of MIT with a degree in economics.